Marshland / La isla minima, Spain 2014. Screening this Wednesday Sept. 9th and Thursday 10th. This combines the police procedural genre with that of the serial killer: a common combination these days. This is very much a genre film, and it is easy to detect the influences of earlier film. I was struck by the parallels with True Detective (HBO, 2014). The film is well produced and the detective duo, Pedro (Raúl Arévalo) and Juan (Javier Guttiérrez) are excellent. But what makes the film really interesting is that the story is set back in late 1980. This was the transitional period after the end of the Franco dictatorship and the ushering in of a ‘democratic’ Spain. This was the period following the ‘Pact of Silence’, also known as the ‘Pact of Forgetting’ by those who had opposed and suffered under fascism. And 1981 was the year that saw an attempted military coup against the new Spain. The film references both of these [in the latter case the reactionary military establishment] and intriguingly in the characters of the detectives references both the reactionary and the radical currents about in Spain at that time. The parallels are carried in both the visual and aural patterns of the film: which also bear the influence of other serial killer films. The director, Alberto Rodriguez, has a penchant for dramatic overhead shots; emphasising the distance of the contemporary audience. The opening such shots also strike an interesting variation of the serial killer labyrinth. The English title is a variation rather than a direct translation, I suspect the settings in the film have strong resonances in Spain. We are in the province of Andalucía where the events occur. Much of the film takes place in the Doñana National Park and the Guadalquivir marshes: the Park was established under the Franco regime in the 1950s. Whilst the name of the town [fictitious?] is Villafranco! I did have reservations regarding the gender and the victims and the violence. This is one of the problematic aspects of the serial killer genre: though the best films treat this critically. There are brief but disturbing visual images, and a short but disturbing description of the violence in the dialogue. I wondered once again about the criteria of the British Board of Film Classification. This film has a fifteen certificate, meanwhile the recent The Diary of a Teenage Girl received an 18 certificate. 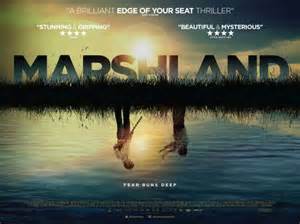 I am sure that Marshland is the more disturbing film: perhaps being a foreign language film the supposed audience differs.